The G4 can seat up to 15 passengers and has a long cabin offering stand up room and a large luggage capacity. 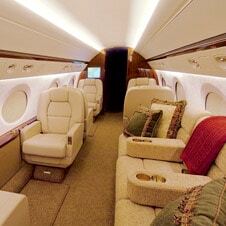 This aircraft offers a high cruising speed and a range of over 4600 miles or up to 9 hrs. The interior appointments reflect the aircraft’s include in-flight communications and entertainment facilities and flight attendant service.